Paperback: Axis Mundi Books, 420 p.
See also Marja’s home page. It is a long time since I was handed a book that from the first page I just kept thinking “Wow! !”… Eureka! This book did and continues to do so. Marja begins her book with the twelfth century Sufi story about ‘the Blind and the Elephant’. A group of blind people feel a part of the elephant and describe what they can ‘see’. Each person tells a part of the story but no one had fully understood the whole of the elephant. As visually able people we can see the whole of the elephant and we understand that if the blind people connect all the bits of the puzzle they too will see the whole elephant. This story is a wonderful way of reminding us that we can only truly understand the world when we connect all the pieces of the puzzle. We will also realise that there are many perspectives and many truths to assembling an idea of a ‘Universal Truth’. 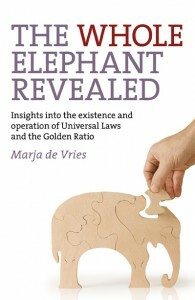 Using ‘The Kybalion’ as a key to universal laws Marja explores the essence of Universal Truth. She explores the 7 laws from many different perspectives, from the ‘pure’ scientific to the more mystical, intuitive approach of shamans, witches and folk magicians. Using cutting-edge scientific discoveries and the Golden Ratio as an underlying universal principle, Marja finds similar discoveries in the non-scientific world. Many things too which we as pagans and witches will say: “yes! We have known that for centuries!” It is however Marja’s eyes and vision which have been able to create a synthesis based on these insights. She presents a bigger picture but in sizeable chunks. Filled with interesting quotes from all kinds of people such Sogyal Rinpoche (Tibetan Buddhist), Fritjof Capra (physicist), Alexander Lauterwasser (Cyematics Researcher) and many more. An excellent book with much ‘food for thought’! I highly recommend it to anyone who is looking for those missing bits of the puzzle. She will be giving presentations in the next few months. Complete overview. Monday October 14, 2013, Ede, The Netherlands Presentation ‘The Whole Elephant Revealed’ (in Dutch) in Spiritual Café Ede at the invitation of Sarala Krabbenborg from ToBeYounique! Thursday December 12, 2013, Antwerp, Belgium Presentation ‘Learning and Education in Balance’ (at the invitation of Noortje Wiesbauer and Koen Fossey as first presentation of a series of three presentations at the University for the Public Interest in co-creation with Sint Lucas, School of Arts. Original publication: De Hele Olifant in Beeld – Inzicht in het bestaan en de werking van Universele Wetten en de Gulden Snede (Ankh-Hermes, 360 p. ISBN: 978 90 202 8460 7, € 29, 95. Ebook: ISBN:97 89020207286, € 19,99. De hele olifant in beeld is een synthese van de gemeenschappelijke inzichten van vele verschillende wijsheidstradities in de werking van de Universele Wetten en de Gulden Snede en de recente baanbrekende wetenschappelijke ontdekkingen die met deze eeuwenoude inzichten overeenstemmen. Hierdoor wordt in feite een geheel nieuw wereldbeeld zichtbaar en wordt het mogelijk om te begrijpen wat er nodig is om de balans te herstellen, zowel in onszelf als wereldwijd. Omdat deze wetmatigheden een universeel karakter hebben, zijn ze van toepassing op alle aspecten van ons individuele en maatschappelijke leven. Ze kunnen dan ook gebruikt worden als uitgangspunt bij alle persoonlijke en maatschappelijke vernieuwingen, die tot doel hebben meer in harmonie te zijn met onszelf en met het grotere geheel. Een geheel nieuw en samenhangend wereldbeeld wordt zichtbaar”. Definitely a highly recommended book! I think that the first line describes it all – it’s a continuous feeling of “Wow! Yes yes! That!”. The most curious thing is that, even thought the author doesn’t mention a single word about Paganism or Witchcraft, it’s basically talking about it the whole time! It’s a book I would recommend to anyone working into any path, specially related to Western Mysteries. The books doesn’t “scientifically justify” magic, but it does lay some breadcrumbs, making it clear that the difference between magic, religion and modern science is not that big.